Oligo Group is proud to announce its new addition “Le Bouleau” apartments. 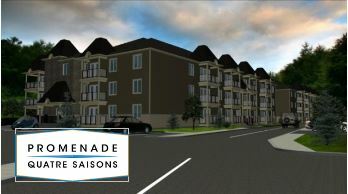 It is part of Promenade Quatre Saisons’ community, located in the heart of the city of Embrun near the most coveted services. Oligo has made its reputation with the construction of several condos & semi-detached homes. “Le Bouleau” completes the project with the construction of apartments designed for those who are 50 years and over. Each unit will have a bright and spacious kitchen with modern cabinets, a three piece bathroom with ceramic floor, high-efficiency forced air natural gas heating system and central air conditioning for maximum comfort. It will be your personal hideaway with the convenience of city life and community retirement living. It promises to be the most affordable retirement lifestyle in Embrun. With rents from as little as $855/month, you can afford to do the things you have always wanted to do. See unit prices and underground parking availability. “Le Bouleau” provides a carefully selected range of recreational amenities with broad appeal to support your healthy lifestyle and vibrant social life by providing a place where you can stay fit, learn new skills and create new relationships. Imagine stepping out of your front door each day with endless possibilities before you! Fully equipped gym area w/ change room & multi-use studio for Yoga, Zumba, etc. Reception room w/ theater & multi-use for social clubs, arts & crafts, etc. Access to tennis court, shuffle board, two outside gazebos w/ BBQ & fishing dock, etc.